The Miami Dolphins are coming off of an 8-8 season where their offense was ranked in the middle of the pack at 14th. The Dolphins compiled 5,601 yards of offense in 2014, but they ranked 17th in passing yards. 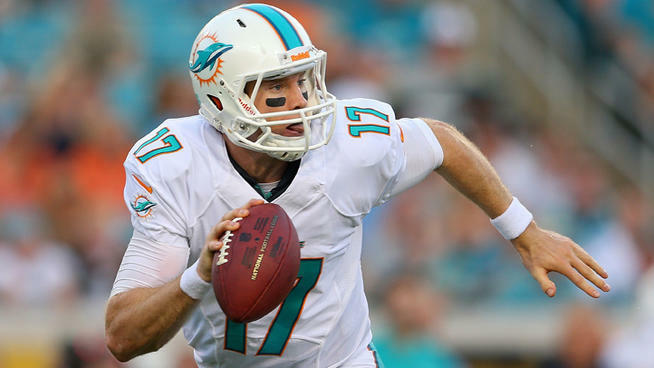 Ryan Tannehill threw for over 4,000 yards in 2014, which ranked 11th in the league. Tannehill only had Mike Wallace and Jarvis Landry as targets. Now, Tannehill has added three new weapons to his arsenal in Greg Jennings, Kenny Stills, and Jordan Cameron. Jennings is known for his great seasons in Green Bay with Aaron Rodgers at the helm, but his production dropped when he went to Minnesota for more money because the Vikings didn’t have a solid quarterback throwing Jennings the ball. Now Jennings will be thrown to by a top 15 quarterback, which should increase both Jennings and Tannehill’s fantasy value. Another weapon they gained is Stills from New Orleans. Stills had a breakout year in 2014 by totaling 931 receiving yards. 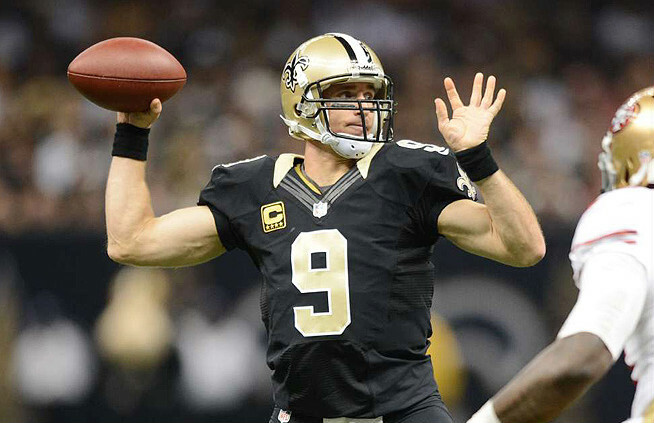 Drew Brees loved going to Stills down the field and in short yardage situations because of his quick bursts of speed. Tannehill lost his pure deep threat in Mike Wallace, but Kenny Stills is a better all around replacement. The biggest addition that makes Tannehill so intriguing to me is the signing of tight end Cameron. This now gives Tannehill a big target in the red zone. I look for Tannehill and Cameron to be a deadly duo when the Dolphins are in the red zone. You can’t go wrong with Tannehill because he will be, at best, a seventh round selection in most fantasy drafts, so you will be able to get a top tier running back or wide receiver in earlier rounds. The Atlanta Falcons had a down year, as they finished 6-10 in 2014. However, the Falcons offense was ranked eighth in the league racking up 6,051 yards. Even better, the Falcons passing attack was ranked fifth, only behind elite quarterbacked teams. 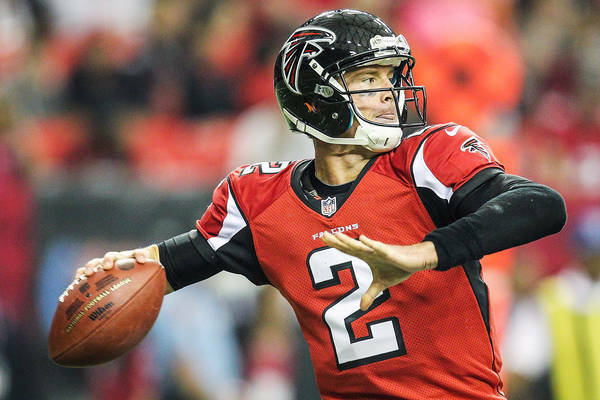 Matt Ryan was a top ranked fantasy quarterback last year, as he threw for 4,696 yards and 28 touchdowns. Ryan was forced to play from behind almost every single game, which caused his interception total to rise to 14. Coming into 2015, Ryan has a new offensive coordinator in Kyle Shanahan, who will use Ryan’s skill set to his full potential. Ryan also has some fairly dynamic weapons in Julio Jones and Roddy White. Both receivers battled injuries in 2014, but that didn’t slow down Ryan’s amazing season. Ryan will also get some production from the tight end Jacob Tamme. Ryan will more than likely fly under the radar in most fantasy leagues because Atlanta had a terrible year in 2014, but that should not be the case. Ryan should be a top fantasy quarterback on your big board heading into 2015. 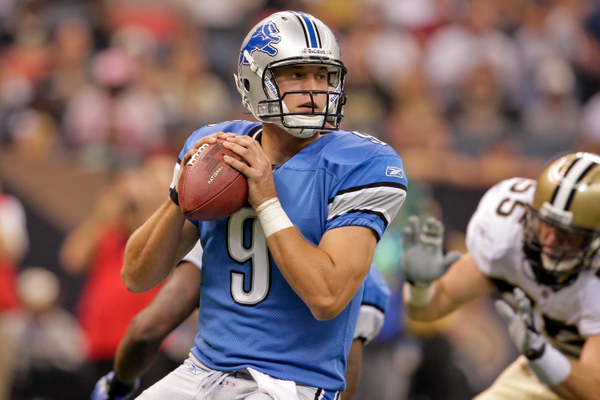 2009 September 13: Detroit Lions quarterback Matthew Stafford (9) looks to throw during a week one regular season game between the New Orleans Saints and the Detroit Lions at the Louisiana Superdome in New Orleans, Louisiana. The Detroit Lions finished 2014 with an 11-5 record, finishing in second place in the NFC North. The Detroit offense ranked in the bottom half of the league at 19th in total yards. However, they did rank a little higher in passing yards at 12th. Matthew Stafford threw for 4,257 yards in 2014, which ranked 9th among quarterbacks. Stafford’s main target last year was Golden Tate due to the injuries that sidelined Calvin Johnson for a few games. Tate secured over 1,300 yards last year while only snagging four touchdowns. Tate is a short yardage mastermind because he has uncanny route running abilities. He isn’t much of a deep threat, but he gets the majority of his yards from yards after the catch. The obvious threat to all defenses is Megatron. Johnson is an absolute beast when it comes to jump balls in the red zone. He just has a knack for finding a way to catch the football. He is consistently a top five fantasy wide receiver because he is Stafford’s go to guy in the red zone. The most interesting Lion coming into 2015 is Eric Ebron. Ebron was selected 10th overall by the Lions in 2014. He has wide receiver speed, yet he is the size of a tight end. This makes him a dual threat tight end to extend the field, or be a check down man for Stafford to dump the ball to in short yardage situations. Stafford is always primed for a great fantasy season, and I like his chances to have a fantastic year once again. Cam Newton is an interesting situation in Carolina because he was the 21st ranked quarterback in passing yards in 2014. Newton had a down year in 2014 as he threw 18 touchdowns and 12 interceptions, but he had a great year on the ground. 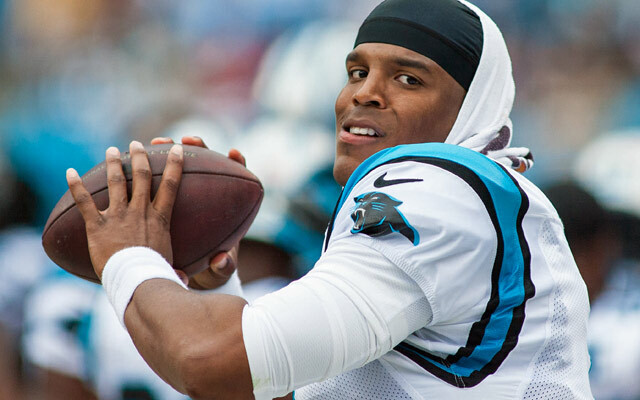 Newton is a great fantasy quarterback because he is a dual threat quarterback who is bound to get outside of the pocket. Newton rushed for over 500 yards and five touchdowns in 2014, and I expect him to at least match that total in 2015. Newton has been working hard this offseason to perfect his pocket passing abilities, which is going to increase his fantasy value mightily. Newton also is bringing back all his weapons from last year like Kelvin Benjamin and Greg Olsen. They also drafted Devin Funchess this year, who will look to provide another deep threat for Newton. I like Newton this year because he will have a strong defense, so the ball should be in Newton’s hands more often than not. I would say that Newton should be drafted no earlier than the third round, but the best spot to take him would be in the fourth or fifth round. Some of you may be wondering as to why I have Peyton Manning as my sixth ranked quarterback because the Broncos finished 12-4 in 2014, and Manning had a great season last year. Manning is 39 years old, and he had a torn quadricep the final few weeks of last season, which hindered his performance enormously. 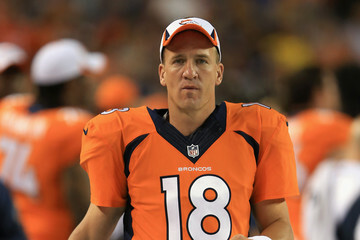 Manning is slowly recovering from the beating he took last season. Losing a big part of Manning’s arsenal doesn’t help either. Manning lost a huge threat in Julius Thomas, even though he was able to keep wide receiver Demaryius Thomas and Emmanuel Sanders. The Broncos are going to have some questions on the offensive line as well, which will make Manning’s job harder if they can’t protect the pocket. I think that the Broncos’ crazy offensive number days are over, but if Manning is there at the right time during your draft, you should draft him. I would not recommend drafting Manning in the first or second round because you can get better value in either a running back or a different quarterback. The New Orleans Saints finished up in second place in the NFC South at 7-9 behind the Carolina Panthers. But they did have the best offense in the NFL as they racked up 6,582 yards, and Drew Brees tied Ben Roethlisberger of the Pittsburgh Steelers for the most passing yards in 2014 with 4,952. The Saints had a dynamic air attack with Brees throwing to Jimmy Graham, Kenny Stills, and Marques Colston. These three guys were fantasy powerhouses, but Brees’ weapons have been diminished. Jimmy Graham was traded to the Seattle Seahawks for an offensive lineman, and Kenny Stills went and signed with the Miami Dolphins. Now Brees doesn’t have, arguably, the best tight end in the league, and he doesn’t have that speedy, sure-handed receiver in Stills. I realize that fifth is a little low for Brees to be ranked, but he doesn’t have any weapons to throw to anymore. Colston is the only “weapon” that Brees has to throw to, but Colston is 32 years old, which isn’t much of a weapon. Brees is going to be able to produce, but not to the eliteness he showed in 2014. I wouldn’t draft him in the first round, but I would look to pick him up in third or fourth round. The Pittsburgh Steelers won the AFC North in 2014 finishing with an 11-5 record, and they had the second best offense behind only New Orleans. 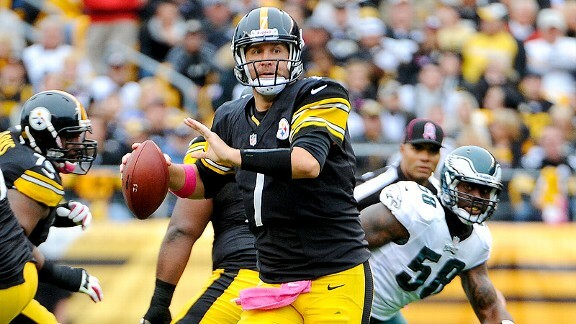 Ben Roethlisberger tied Brees of the Saints for the most passing yards in the league at 4,952. The Steelers are emerging as one of the best offenses in the league behind Roethlisberger’s uncanny ability to extend plays and find the open receiver. The Steelers also have the best running back and, arguably, the best wide receiver in Le’Veon Bell and Antonio Brown. Brown set an NFL record for most consecutive games, 33, with at least five catches and 50 yards, and Bell is a monster after the catch. Roethlisberger also has a deep threat receiver in Martavis Bryant, who was a rookie in 2014. Bryant is able to come down with just about any jump ball thrown his way, which gives the Steelers another red zone threat. I look for the Steelers to have one of the best offenses in the league this year behind the arm of Roethlisberger. I wouldn’t be surprised if he was drafted in the first round in some leagues. I would think the second or third round would be the best spot to take him. The Seattle Seahawks came just two yards away from another Super Bowl title last year. They finished the the regular season with a 12-4 record, and they were the ninth best offense in the league. However, their passing attack ranked 27th, while their run game with Marshawn Lynch ranked first. Russell Wilson added a new weapon to his arsenal in tight end Jimmy Graham. Wilson now has a go-to guy in all situations, especially in the red zone. Graham is a nightmare for all defenses because of his unusual speed and size. Graham will most definitely be the Seahawks leading receiver in 2015, which will give Wilson a huge boost in fantasy value. Another reason Wilson is a huge fantasy threat, he is a running quarterback. Wilson has to ability to extend plays and drives with his legs. 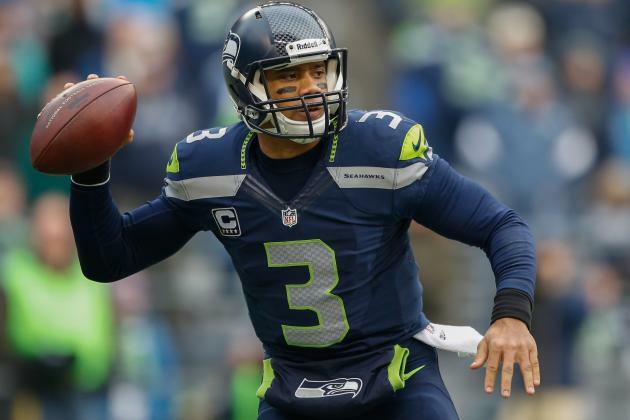 Wilson scored six touchdowns on the ground, while racking up over 800 yards rushing. Wilson is third on my big board because of his rare abilities and his newly acquired weapons he gets to throw to. Wilson will most likely be a second round pick, and I wouldn’t try to draft any higher. 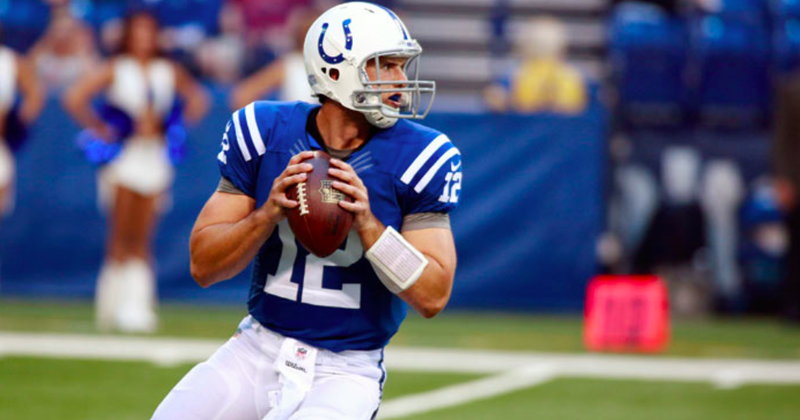 Andrew Luck’s Colts won the AFC South in 2014, and Luck was third in passing behind Roethlisberger and Brees. Luck’s main target was T.Y. Hilton, who emerged in 2014 as one of the top receivers in the fantasy world. Luck also added a new jump ball threat in Andre Johnson from Houston. I realize that this is probably Johnson’s final solid season, but he still gives Luck a trustworthy wideout. Another reason Luck is my second ranked quarterback, the Colts signed Frank Gore. Gore will be able to change the pace for the Colts, so Luck doesn’t have to drop back on every down. Gore is also a fantastic catching running back, which will provide Luck with a reliable check down man. Luck will be a fantasy stud for years to come because of his insanely high football IQ. I wouldn’t be surprised if Luck was the first quarterback taken in some leagues, but he is definitely worth a first or second round pick. 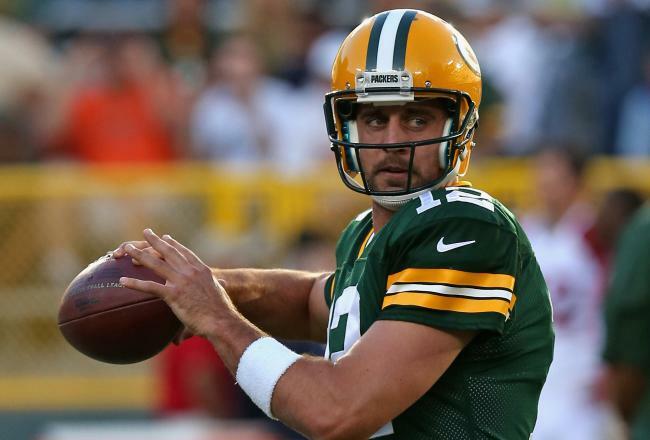 Aaron Rodgers has been revered as the best fantasy quarterback for years, and I am following suit with making him my top ranked quarterback in 2015. The Green Bay Packers were able to resign wide receiver Randall Cobb, who was a coveted skill position free agent this past offseason. Jordy Nelson and Cobb are one of the deadliest duos in the NFL because of how Rodgers distributes the ball. He just makes every single player around him better. Eddie Lacy will provide ground game stability for the Packers, which will, in turn, open up the passing game for Rodgers. Aaron Rodgers is going to be drafted in the first round, and if he is available when you pick, take him. The only way you should pass on him is if there is an elite running back still on the board like a Le’Veon Bell, Adrian Peterson, or Jamaal Charles.